Technology is providing access to so much information—and disinformation—that it is overwhelming individuals’ ability to determine what is true. While trust in government is vital to a healthy democracy, so is a certain measure of distrust. Trust is a critical element in the functioning of democracies, but it must be balanced: too little trust in government leads to political dysfunction, but too much trust can lead to autocracies. Citizens need not agree with every government action or trust each individual officeholder. At a minimum, citizens must trust that the democratic political process will protect the national interest, act responsibly and uphold the rule of law. Holding those in power accountable is a critical element of a democratic republic. Another vital element is communication between the government and the citizenry. Therefore, freedom of the press, protected by the Constitution, is elemental to self- governance. 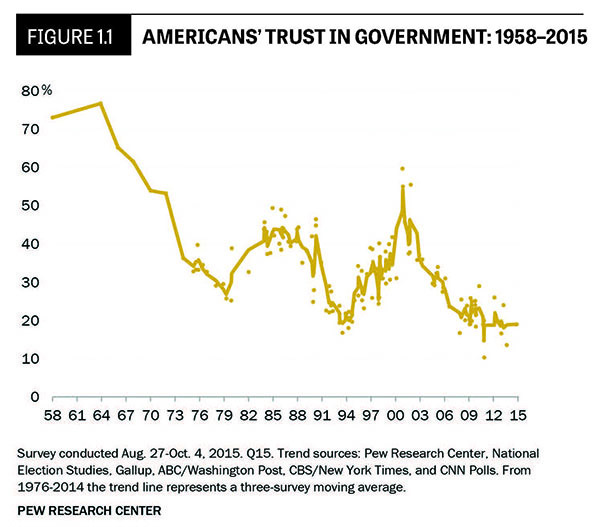 The overall level of Americans’ trust in government has declined over the past half- century and now stands at or near historically low levels. The decline in trust is not confined just to government. Surveys show a similar decline in trust in many institutions, including big business, NGOs and the media. This erosion of trust is not just an American phenomenon. There is a similar crisis in trust in many other countries. Trust in media globally is at an all-time low. These developments, together, constitute a crisis of trust in democracy in this country as well as elsewhere that warrants the attention of every leader, businessperson and citizen. For over two centuries, Americans have wrestled with what it means to govern themselves. Through triumphs and setbacks, America’s great experiment with self-governance has sparked the country’s imagination and inspired millions around the world to push for democratic values and republican forms of government in their own countries. That legacy now faces challenges on multiple fronts. This is not a time for complacency. Americans are not immune to history nor to the forces that have eroded—and in some cases eclipsed—democratic norms and institutions around the globe. There is a crisis of trust in American democracy. In response, several independent commissions are exploring ways to restore faith that this long-lived representative democracy can renew itself. This document is the report of a commission that focused particularly on the role of trust in the ongoing interplay between media and democracy. THE VISION. The Knight Commission on Trust, Media and Democracy, 27 diverse citizens organized by the Aspen Institute in partnership with the John S. and James L. Knight Foundation, hopes for an American future that promotes knowledge of the country’s democratic heritage, an understanding of the tools that citizens can use to govern, a willingness to engage in local civic activities, and responsive governmental, political, media, business and civic institutions at all levels. It envisions leadership that acts effectively to advance better lives for all, a society that the youth of today and tomorrow enthusiastically want to join, one that serves well the ideals of this country. It sees vibrant, critical and responsible journalism serving the broad goals of self-government, including speaking truth to power, and a society where new forms of communication enhance rather than diminish our way of life. And it expects consistently reliable news available so citizens are able to engage effectively in their communities. The Commission can envision that bright future, but only if we act together now to respond to the crises defined below. A CRISIS OF DEMOCRACY. As shared bonds have frayed, Americans are polarized. Their faith in democratic institutions has declined, along with civic engagement and the sense of a common American identity. Democracy is a generalization. It could encompass many different concepts. The Commission has considered a variety of democratic models, including direct, communitarian, pluralistic, deliberative and representative democracy. We recognize that the United States is a representative democracy more accurately described as a republic. In this report we use “democracy” as shorthand for the values, institutions and aspirations of representative self- governance asserted and protected by the United States Constitution. Among the factors that have undermined Americans’ faith in democratic institutions are a perception of government as increasingly dysfunctional, dislocations caused by globalization and immigration, political polarization, large inequalities in wealth and income, reduced upward mobility and racial tensions. While a free press and robust journalism are essential elements of a healthy democracy, much of the public doubt that the national news media are unbiased and fair and are concerned that social media have been used to disseminate disinformation. A DEFICIT IN CITIZENSHIP. Normally only 50 to 60 percent of the voting-age population votes for the U.S. presidency, and far fewer cast ballots in off-year elections. In the 2014 midterms, for example, voter turnout was about 37 percent, though voters did turn out in record numbers for the midterm election in 2018. Participation in local civic activities is down from a half-century ago, and knowledge of the basics of civic literacy—the fundamentals of our democracy—is dismal. Fewer than 25 percent of eighth- graders could pass a basic proficiency test in civics in 2014. Reasons for civic disengagement range from how we allocate our time and attention to a lack of basic civic education to insufficient access to resources such as quality local news. THE CRISIS IN TRUST. Layered on top of these challenges to American democracy is perhaps an even more disturbing development—the inability to agree on facts. As Daniel Patrick Moynihan famously said, “Everyone is entitled to their own opinions, but they are not entitled to their own facts.” Yet, in 2018, facts that are considered unfavorable are branded as fake, false information is shared widely over the internet, and powerful technologies are becoming increasingly available that can manipulate video images and voices to convincingly portray something that did not happen. Advances in technology, such as digital social networks, have given many citizens access to the world’s great pool of knowledge and people. Yet readers and viewers today often have great difficulty ascertaining the reliability of a source or assertion. Technology is providing access to so much information—and disinformation—that it is overwhelming individuals’ ability to determine what is true, especially in the absence of widespread digital literacy. Bad actors using digital platforms of major technology companies to manipulate and influence people with false information are making this problem worse. Thus, superimposed on the concerns over American democracy is a crisis in trust in media and in basic information. But a “post-truth” politics is incompatible with a functioning democracy and is a fundamental attack on our ability to self-govern. Today, Americans need to strive for a stronger vision of democracy and citizenry. It includes the right and obligation to voice one’s beliefs and to grant the same to all fellow citizens in search of shared truths. As Supreme Court Justice Oliver Wendell Holmes wrote a century ago, “The best test of truth is the power of the thought to get itself accepted in the competition of the market…. That, at any rate, is the theory of our Constitution.”i The marketplace for ideas, though, presumes an electorate willing and able to search for the truth. A democracy cannot function without the trust of its citizens. They need to believe in a democratic political process that will act responsibly to uphold the rule of law, promote the general welfare and protect the national interest. While trust in government is vital to a healthy democracy, so is a certain measure of distrust. The need to maintain a balance between the two disparate attitudes is described as “the paradox of democracy.” One way to understand this paradox is by distinguishing between two types of trust: particular trust in an administration or individual official, which can be contingent, and a deeper, more enduring general trust in a political process that includes disagreements among competing factions and assumes an orderly sharing of power. Democratic politics can function effectively even when many citizens lack trust in an individual incumbent. In fact, partisan politics assumes such conflicts and offers the recourse of “voting the rascals out” in the next election. A decline in general trust is a more serious issue. What Has Happened to Trust? Democracies can and will operate with a certain amount of distrust in their leaders and their actions. But a lack of general trust in the legitimacy of the political process represents a significant challenge to the functioning of a democracy. Numerous studies have found that the overall level of trust in government among Americans has been declining steadily over the past half-century and now stands at or near historically low levels. For example, a survey conducted by Gallup has tracked public trust in government annually since 1958. In 1964, nearly three-quarters of Americans (74 percent) said that they “trusted the government in Washington to do what is right ‘just about always’ or ‘most of the time.’” Over the next two decades, the percentage of Americans who expressed high trust in the government began falling (see Figure 1.1). There were temporary upticks in this indicator in the 1980s during the Reagan years and again in the mid- to late-1990s during the Clinton years and again in the early George W. Bush years (with a sharp but short-lived surge in trust in the immediate aftermath of 9/11). But the overall trajectory for trust has been downward and has remained below 25 percent for the past decade,v just one-third the level of trust at its high point 50 years earlier. It is as difficult today to find a citizen who has a high degree of trust in government as it was to find someone with a low degree of trust in government in the mid-1960s. Other major surveys confirm this trend. For example, the American National Election Studies (ANES, a collaboration between the University of Michigan and Stanford University), which has been surveying American voters since 1948, finds a similar decline in trust—from a high above 60 percent in the 1960s to a low under 25 percent today. The decline in trust in government is not the whole story, however. It needs to be seen in the context of two larger trends: first, the parallel drop in Americans’ trust in a broad range of other institutions, and second, a similar pattern that is happening globally. 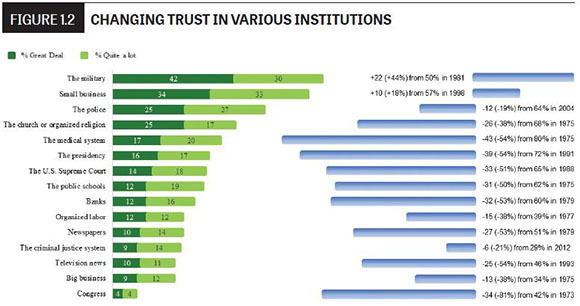 DECLINING TRUST IN MANY INSTITUTIONS. In addition to surveying Americans about their trust in government, in 2018 Gallup also asked about their level of trust in other important institutions. Only three institutions—the military, small business and the police—currently enjoy trust levels above 50 percent. Media organizations are near the bottom in this survey, with newspapers at 24 percent and television news at 21 percent, along with big business at 21 percent and Congress at just 12 percent (see Figure 1.2). An analysis of the Gallup data by MIT scholar Ethan Zuckerman (graph at right in Figure 1.2) shows that only the military and small business experienced an increase in trust over time, while all the other institutions in the survey saw drops. While the Gallup survey found a steady decline in trust in both newspapers and television over the last few decades, a 2018 Poynter survey has found that consumers appear recently to be reversing this trend, particularly for local media. This apparent inconsistency may be explained by the confusion in what exactly the respondent sees as “the media.” That term is extremely broad and could include local, national, print, broadcast, online, politically-driven or other media. One might trust a local outlet, or one attuned to his or her political outlook, and still distrust “the media” in general. GLOBAL DECLINE IN TRUST. The erosion in trust in key institutions is not confined to the United States; it is a global phenomenon. For 17 years, the Edelman Trust Barometervi has been tracking the level of trust in key institutions among citizens of 28 countries. The 2017 edition of the Barometer found what it describes as “a profound crisis in trust” worldwide. Two-thirds of the countries included in the survey were classified as “distrusters” (with less than 50 percent of respondents expressing trust in the institutions of business, government, media and NGOs to “do what is right”), compared with half of the countries in 2016. Among the four key institutions, government and the media were the least trusted, with trust in media declining by the greatest amount among the four. Edelman reported in 2018 that globally, “trust in media plunges to all-time lows,” with trust levels well below 50 percent in all but a handful of the 28 countries in the survey, making media the least trusted of the institutions it tracked. A study from the Organization for Economic Cooperation and Development (OECD) reported that “only four out of ten citizens in OECD countries say they have confidence in their national authorities.” A more recent report on public attitudes in the European Union found that a majority of EU residents (56 percent) did not trust their national governments, but results varied substantially from country to country. The symbiotic relationship between media and democracy cannot be overemphasized. Citizens need media for information and engagement at every level of governance, and to hold those in power accountable. Governments need media to communicate and account for their policies to the citizenry in order to remain legitimate representatives of the sovereign populace. The media—whether local or national, liberal or conservative, print, broadcast or digital—are the lifeblood of the republic. But like any blood relationship, the link between press and government can become strained, and certainly has shown fissures throughout America’s history (see Chapter 2). We are currently at a particularly tense and unfortunate moment in this relationship. Critics, citing article after article that they see as unjust in their coverage of the President and the government, believe that much of the media has a pervasive bias against him. Others welcome strong, critical coverage of the Executive. But the Commission is particularly concerned that the current presidential administration has repeatedly attacked the integrity of much of the press, independent of issues with particular articles or reporters. Respect and support for the rights and safety of the media are vital to the health of America. Far from being the enemy of the people, a free and fair press is essential to the governance of this country. The American public needs to stand by and for the strong protections of the press that inhere in the First Amendment. Recent foreign and domestic attacks on the American political process are well documented. To heed Lincoln’s warning, individual citizens, political leaders, businesses and civil institutions must consider their responsibilities, as participants within the democracy, to resist the attack—or decay—from within. i Abrams v. United States, 250 U.S. 616, 630 (1919). ii Michael J. Robinson, “American Political Legitimacy in an Era of Electronic Journalism: Reflections on the Evening News,” in Television as a Social Force: New Approaches to TV Criticism, eds. Douglas Cater and Richard Adler (New York: Praeger, 1975). iii Federalist, no. 10 (James Madison). iv Mercy Otis Warren, “Observations on the New Constitution, 1788,” in The Patriot’s History Reader: Essential Documents for Every American, eds. Larry Schweikart, Michael Patrick Allen, and Dave Dougherty, (New York: Sentinel, 2011). vi Richard Edelman, CEO of Edelman, a global communications marketing firm that conducts this survey, is a member of this Commission.